For more than a year the deadly protests have swept the Tibetan plateau, waves of people burning themselves alive in a widening challenge to Chinese rule. The prime minister of Tibet's government-in-exile calls them acts of desperation. The Dalai Lama says they give China an excuse for even harsher crackdowns. But to many Tibetans, they are carefully reasoned attempts to bring attention to an often-forgotten cause. In Tibet, the horrific has become normal. More than two dozen Tibetans, many in their teens or 20s, have set themselves on fire since early 2011 in an unprecedented series of suicide-protests. In the moments before they are overwhelmed by pain or tackled by Chinese security, they cry out for the Dalai Lama's return to Tibet, for an end to China's crackdowns or for their homeland's independence. There is little sign that the immolations could lead to a broad uprising. But they have embarrassed Beijing and are testing Chinese policies across the Tibetan plateau. The protests also have taken place far from the Tibetan heartland, showing opposition to Beijing's rule is geographically more widespread than ever. Most of the immolations have occurred in ethnic Tibetan regions in China's Sichuan and Qinghai provinces. While the most restive towns have been effectively sealed off, some details have emerged: the Buddhist monk who drank gasoline before dousing himself with fuel and setting himself alight; the two young men who set themselves on fire, then ran together into the streets shouting for the return of the Dalai Lama; the nun, seen in a video distributed by activists, walking along a busy street engulfed in flames. 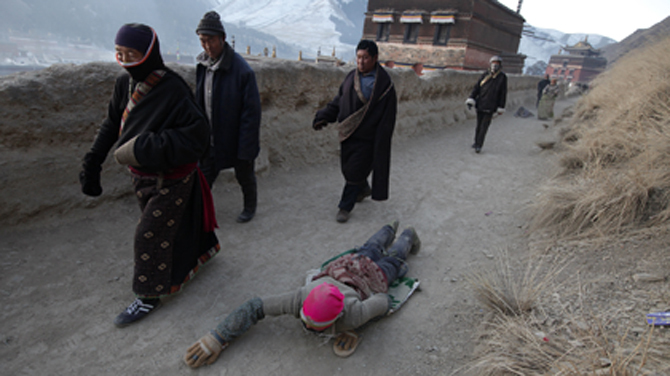 At one point, a woman tosses a white scarf—a Tibetan offering of respect—at her feet. “The self-immolations don't hurt anybody else. They just want people to see that there are problems here,” said a young schoolteacher in trendy faded jeans in the small Tibetan town of Hongyuan, in China's Sichuan province. He spoke on condition of anonymity fearing retribution by Chinese officials. Until recently, though, such protests were rare among Tibetans, raised in an enveloping Buddhist culture that normally discourages suicide. While there had been a handful of earlier Tibetan suicide protests, the recent surge began March 16, 2011, when a 20-year-old monk at Sichuan's Kirti monastery burned himself alive, apparently to mark the anniversary of a 2008 protest brutally crushed by Chinese forces. The burnings spiked in October, and then again in January. There have been at least seven so far in March, activists say. The Kirti monastery, which has emerged as a center of political activism, has been the focus of the protests, with at least 14 current and former monks among the self-immolators. The monastery and the town around it, Aba, have been flooded with Chinese forces. Soldiers and police in riot gear now line the town's streets, and more have been posted inside the monastery. But they have been unable to stop the protests. The roots of the self-immolations lie along Tibetan periphery. Aba, like most of the towns that have seen recent suicides, is well over 1,000 miles (1,600 kilometers) from the Tibetan capital of Lhasa. Until the 1990s, China's most repressive policies were concentrated on the official Tibetan Autonomous Region, with Tibetans living to the east, in Sichuan and Qinghai, given freer reign. When protests shook Lhasa in the 1980s, they barely touched Sichuan. In Tibet, where monasteries often serve encompassing roles—school, cultural center, home to the sons of local families who have become monks—Beijing's moves created a bitter cycle of revolt and repression, with Tibetan protests leading to ever-more official interference, which in turn sparked more protests. Aba now looks like an occupied town. During a clandestine late February visit by an Associated Press reporter, roadblocks guarded every road into the town, while members of Chinese security forces massed along the main street and outside the monastery. “People have never seen the type of restrictions that exist now in Aba,” said Lobsang Yeshe, a monk from the town who fled to India more than a decade ago. He is now based at Kirti's brother monastery, in Dharmsala, which keeps in close contact with Aba. He said the crackdown and what he calls “the invisible troubles”—everything from the influx of ethnic Han Chinese to Tibetan nomads encouraged to settle into permanent homes—have nurtured the self-immolations.